Although this may sound like science fiction, Dr. Eduardo Nicolau and his students are working very hard to find solutions to these real-world problems. For instance, astronauts, people with severe health conditions, and countries where water scarcity is an issue, could benefit from Dr. Nicolau’s research. But, how is he planning to accomplish these solutions? It is by studying the interaction between nanoparticles and biomacromolecules. What this means is that Dr. Nicolau focuses on trying to understand how tiny materials, called nanoparticles, “see” biological molecules. “We would like to know if they ‘meet and greet’ or if they ignore each other”, expressed Dr. Nicolau. Depending on the kind of interaction, Dr. Nicolau decides if these nanoparticles or biological molecules are suitable for solving the aforementioned real-world problems. Certainly, his research group has demonstrated to be a prolific one, ever since it was founded three years ago. Dr. Nicolau currently supervises 8 graduate students, and has supervised 30 undergraduates since his appointment as an Assistant professor by the Department of Chemistry at the University of Puerto Rico Río Piedras. He admits that time management, as a new faculty member, could be challenging. A professor should learn how to effectively allocate his/her time among the following activities: teaching, administrative responsibilities, service within the community and the university, and the organization and development of his/her research laboratory. Interestingly, this young researcher has not been intimidated by any of these challenges. In order to obtain funding to establish his research laboratory, he wrote and submitted 10 proposals during his first year as a faculty member. “It is an exhausting task, but obtaining favorable decisions is truly satisfying, this means that your colleagues considered your scientific ideas as relevant and important within that particular field of research”. Dr. Nicolau’s hard work has yielded success as he has been awarded with federal and local funds to support his research projects. His most recent grant was awarded by the Puerto Rico Science, Technology, and Research Trust for his proposal entitled: “Nanocomposites based on nanocellulose for removal of emerging pollutants: water remediation strategy”. Graduate student Valerie Ortiz working to develop membranes with anti-microbial capacity for water purification purposes. Photo provided by Dr. Eduardo Nicolau. Nowadays, according to Dr. Nicolau, there are great challenges in many different parts of the world regarding water infrastructure and potable water. “Because of this, we are interested in developing a filtration system that operates for prolonged periods of time and that is not prone to bacterial growth. This is being accomplished by the interaction between nanotechnology and biology”. It is imperative to mention that NASA is currently funding one of Dr. Nicolau’s research projects. This funding has pushed his career forward and helped improve research capacity and infrastructure at the university. When he was in the process of writing this grant proposal for NASA, he budgeted salary for three graduate and three undergraduate students. “This is very important because, without students, performing research is an extremely difficult task”. One of the things he enjoys the most is the day-to-day interaction with his students. “I love when they tell me how their experiments are going and I get to learn a lot from them. I appreciate this interaction with the students very much…and learning about their progress makes me proud”, he said enthusiastically. 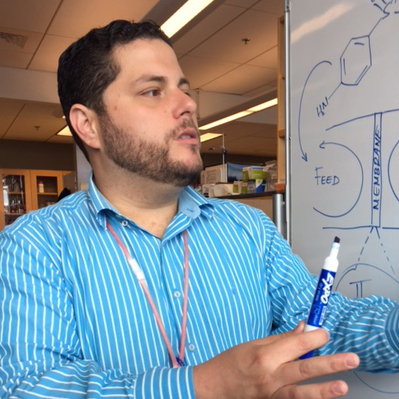 Dr. Nicolau not only works with students in his research lab but also within the classroom. His courses are very interactive. Instead of transferring knowledge onto his students, he is constantly encouraging them to develop critical thinking skills. This promotes discussions about myriad of scientific topics. He constantly brings new and innovative strategies into the classroom, something that he learned from several teaching workshops. “We, as scientists, are trained to do science, but pedagogy is a completely different story. It is always good to learn about this field”. Dr. Nicolau is a product of public education. He attended the following schools: San Agustín Elementary School, Río Piedras; Venus Garden Middle School, Cupey; and Berwind High School, Carolina, Puerto Rico. During those years, he developed an interest in science. He started to pay detailed attention and thus to formulate questions regarding nature. While in middle school, he worked on an interesting project: “We built a model to simulate landslides, and (learned) how vegetation decreases the impact of these landslides. I remember being fascinated by this simple representation, and since then I started getting interested in re-discovering my surroundings and creating new things”. Because of this, his family thought he was going to pursue an engineering degree but he was more interested in science than math back then. This changed when some of his teachers helped him appreciate “numbers” again. During senior year, Prof. Jiménez, the instructor of a Biology course with an emphasis on environmental sciences, inspired him to pursue a science degree. Dr. Nicolau explains strategies for the formulation of new methods to remove emerging contaminants and for the detection of arsenic in water. Photo courtesy of Dr. Nicolau. He was admitted to the UPR Río Piedras. Back then his main goal was to become a medical doctor, which is not an uncommon dream for most Natural Science students. He was not familiarized with careers other than medicine. His parents could not offer advice on this matter because he was the first member of his family to become interested in pursuing a degree in science. While he was enrolled in a general Chemistry course, during his sophomore year, he discovered his true call. He did not want to do anything else other than reading about Chemistry. He was captivated by learning how to see the world from a molecular perspective. Since then, he dedicated his life to the study of chemistry at its fundamental level. He got involved in different research projects while he was an undergraduate student, from molecular biology to biochemistry. Furthermore, he worked in the field of renewable energy, specifically on catalysis, a field that focuses on creating materials that could harvest energy from fuels in an eco-friendly way. In addition to his research experiences as an undergraduate student, he developed a particular interest on being a tutor for his peers. He enjoyed explaining complex concepts to his classmates. It was then when he understood that, in order to become a professor, he needed to complete a graduate degree. He enjoyed double majoring in chemistry and environmental sciences. These experiences reaffirmed his desire to continue graduate studies in the field of Chemistry. He made a transition from an undergraduate degree to a PhD degree, skipping the Master’s altogether. Once he was admitted to the graduate program in Chemistry at the UPR, he was concerned with how to cover the expenses of his education. Nevertheless, very soon he realized that there were scholarships and fellowships available for graduate students. Without wasting any time, he benefited from a NASA program, whose main objective was to support students throughout graduate school. His research projects were supported by several NASA programs including: “NASA Center for Advanced Nanoscale Materials”, “NASA Graduate Student Research Fellowship”, and “NASA Jenkins Pre-doctoral Fellowship”. Dr. Nicolau highlighted: “…there is a program which supports the largest amount of undergraduate students, which I have the privilege of directing, the Puerto Rico Louis Stokes Alliance for Minority Participation (PRLSAMP). The goal of this program, sponsored by the National Science Foundation, is to increase the participation of Hispanics, women, and other underrepresented groups in the science fields so they can continue studies in these fields. It supports undergraduates as well as PhD students”. Student Karlene Vega develops a sensor for arsenic detection through electrochemical methods. Photo provided by Dr. Eduardo Nicolau. Dr. Nicolau’s PhD dissertation focused on electrochemistry. The motivation to pursue this research project arose from previous collaborations between his PhD advisor, Dr. Carlos Cabrera, and NASA. At the time, NASA was looking for systems that could degrade human urine and turn it into energy and other useful chemical compounds. Dr. Nicolau’s graduate work focused on a biochemical reaction performed by a protein that degrades urea. Urea is a molecule that is commonly found in urine. The protein that Dr. Nicolau used in his studies, breaks urea into two molecules of ammonia. These ammonia molecules were the ones that he wanted to utilize to produce energy. After he successfully earned his PhD, he completed one year of post-doctoral research at NASA's Ames Research Center in California and the UPR. This experience opened the doors to new opportunities. For instance, he was hired as the Scientific Administrator of the Molecular Sciences Research Center at the UPR. He learned a great deal about scientific instrumentation and administrative responsibilities, while in this job. Thereafter, in 2014, he was recruited by UPR Río Piedras as a researcher and Assistant professor in the Department of Chemistry. Undoubtedly, Dr. Nicolau is a talented investigator who recognizes the importance of mentors during his career. “My dissertation advisor, Dr. Carlos Cabrera, was a very important person in my career, he taught me with his example on how to do the right thing. He has unshakable values and moral stature”. Dr Nicolau has a promising future as a researcher and as an educator. His advice to new generations of scientists is: "... work with passion and dedication. We need more researchers and more students to get involved in this task, so we can make Puerto Rico a prosperous place where we can create solutions to our problems, where we can market the products of our research and generate income for our beloved University. In short, I would tell them not to give up and to always seek help ... there are many good people who want to help". Dr. Nicolau's research group. Photo provided by Dr. Nicolau.